All along the South Ponil you have seen evidence of placer mining - old sluice boxes and large rock piles. French-Henry Mill Site will be your first taste of the big mining operations once carried on in the Baldy area. Named after Henry Buruel who obtained mining rights from Lucien Maxwell in the 1860's, French-Henry Mine was reopened in the fall of 1938 and operated until Christmas of that year when it was closed because of low yield and high expenses. A tramway ran 1,040 feet to the mine entrance high above you to the north. High up on the ridge to the west you can see the Ponil Entrance to the Aztec Mine. 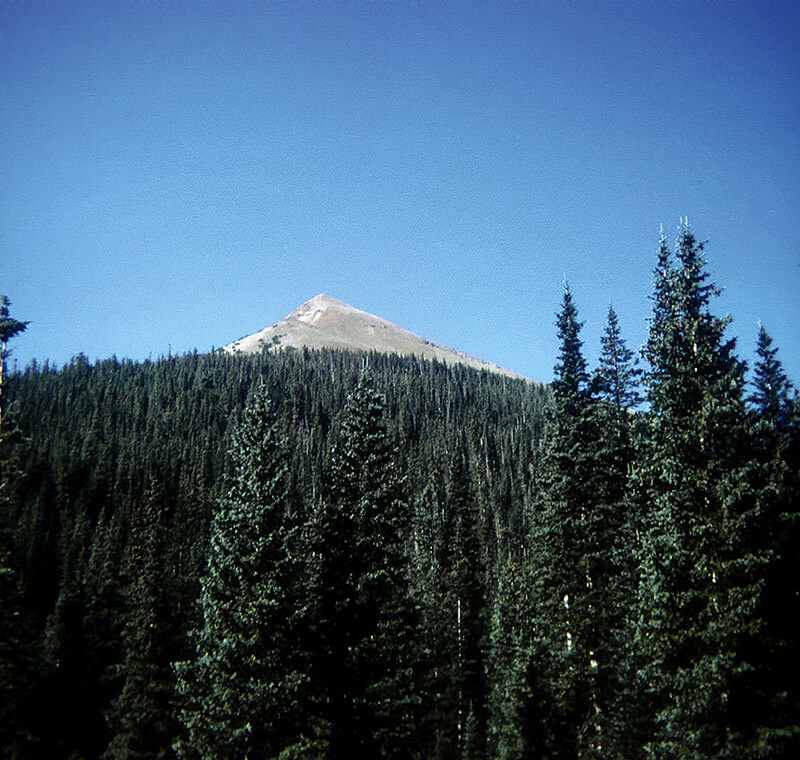 Pueblano Camp serves as the gateway to the Baldy Country, Philmont's newest addition and an area of great interest to historians because of the extensive mining operations which took place here over the past century. Left Copper Park for French Henry Mine - saw museum but couldn't tour mine because of lack of time. Left French Henry for Pueblano - easy, downward hike. Arrived in time for 30.06 range. Shot 3 shots - got 12 out of 15 - bad kickback. At night, we saw "Junior", the "camp bear". 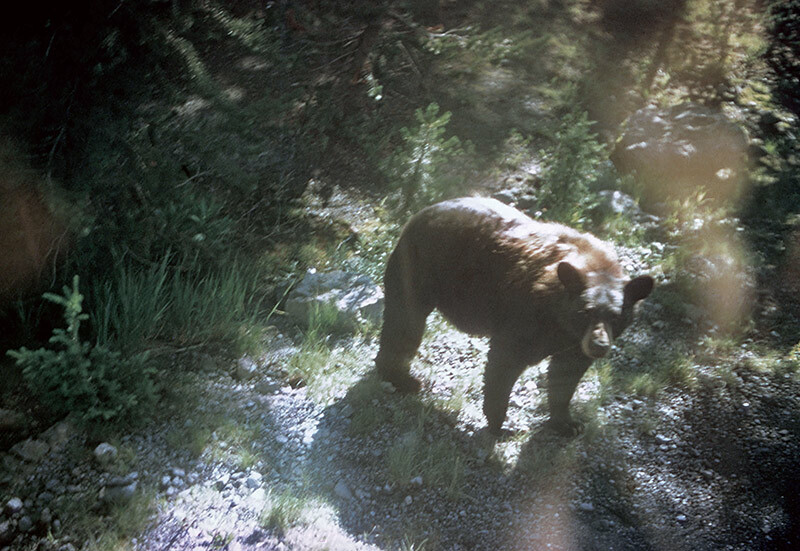 He was in the next campsite calmly wrecking it & stealing food - we had to leave camp but he never came. Showered at night. Met John Krob for 1st time - he became a good friend of our crew (he's a ranger at Pueblano). After the assault on Baldy this was a nice change, for it was all fairly level or downhill. We had hoped to get a tour of the mine at French-Henry Camp, but we were running late and had to skip it. 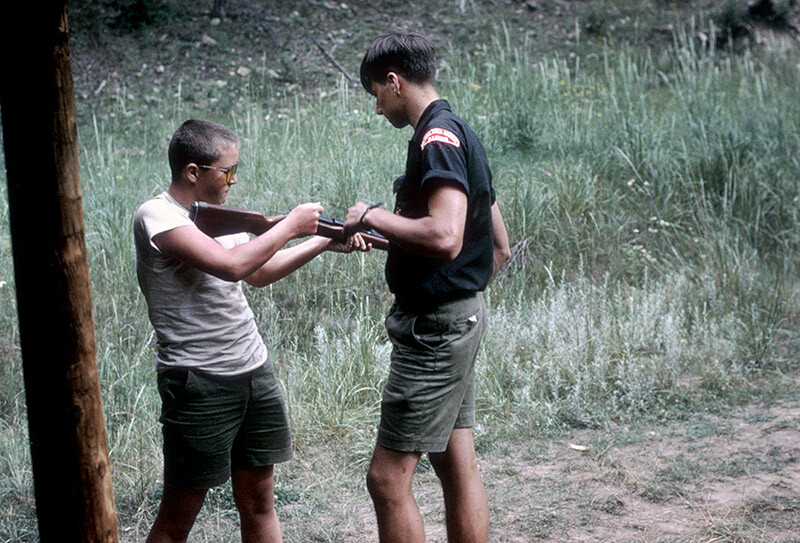 Instead we marched on to Pueblano, where we spent the afternoon on the rifle range. This was taken early in the morning, just before we began our hike to Pueblano. As can be seen, it was a beautiful day, not a cloud in the sky. This was a real highlight of the trip for many of the crew. The gun had quite a kick, as mentioned in my journal. I don't remember any of us excelling as marksmen. Although this guy looks real nice and peaceful, he managed to show his true form when my brother got too close to him. For that, Jim ended up proving he could outrun a bear. He also lost his eating utensils and had to carve a fork to use for the rest of the trip. 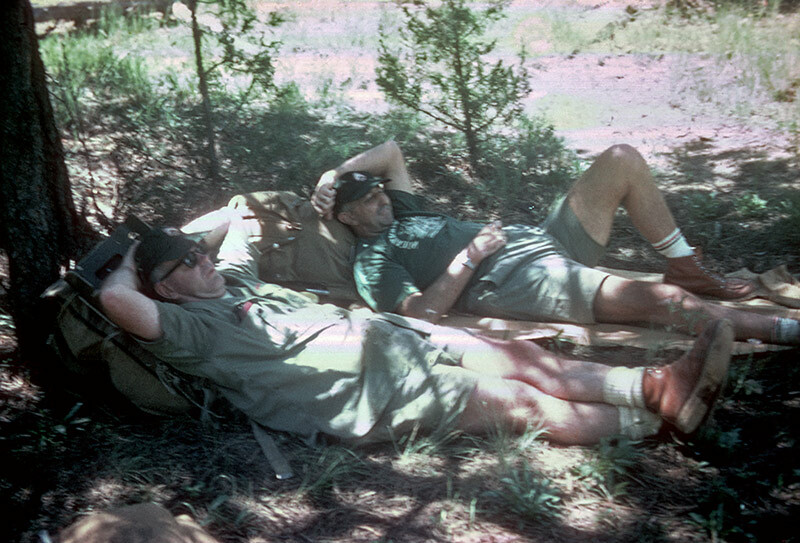 The leaders of the other crews enjoying a respite from the trail. They weren't with us for the stop at Pueblano, but somehow this picture ended up in my photos from that day, so here they are!